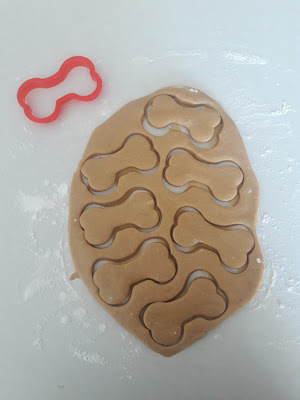 National Dog Day is tomorrow so I thought I would share the recipe for the Peanut Butter Dog Biscuits I made for Scout's half birthday. Mix the flour, egg and baking powder in a large mixing bowl. Add in the water, peanut butter and honey and mix until well combine. Spread flour on a clean work space. Roll the dough until half an inch thick. Cut biscuits using your desired cookie cutter. Remove the excess dough and transfer the cut biscuits to a cookie sheet. Repeat until you reach your desired amount of biscuits or until dough runs out. To make the biscuits look more authentic I used a fork to create divots in the center of the biscuit. Place biscuits in the oven and bake for 18 minutes. They were super soft and stayed that way for days. Scout seemed to enjoy them too! 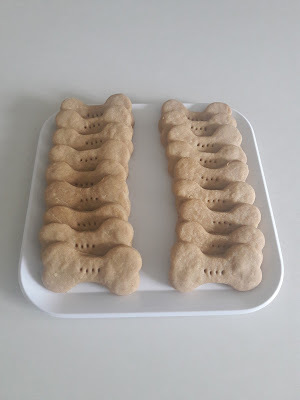 Have your made your pets homemade treats before?